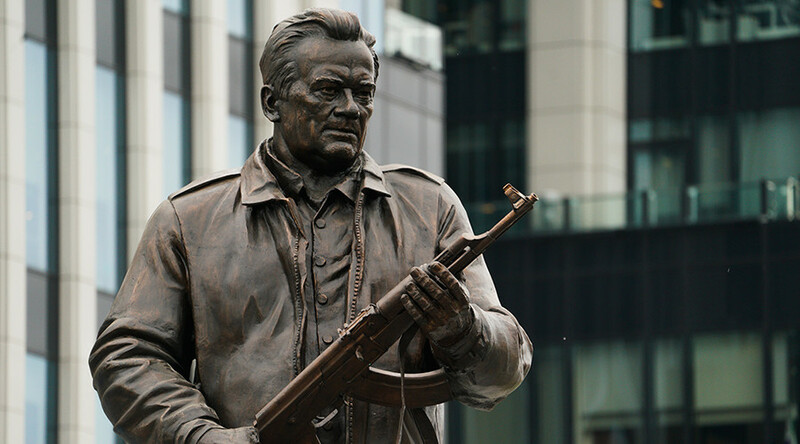 A monument to Mikhail Kalashnikov, the renowned Russian weapons engineer, has been unveiled in central Moscow. Kalashnikov is shown holding his iconic assault rifle, the AK-47, which is believed to be world’s most-produced firearm. The five-meter bronze figure standing on a four-meter pedestal was presented to the public in a ceremony on Tuesday. Sculptor Savlat Scherbakov, who created the monument, said he wanted his work to represent a fight between good and evil, as befits a man whose life’s work was an instrument of death. The pedestal is engraved with an image of Archangel Michael, the general of the host of angels in a war against Satan and namesake of the late weapons designer. “Archangel Michael’s spear is a weapon meant to fight evil of the world,” the sculptor explained. There are an estimated 100 million AK-47 assault rifles currently in use, and the weapon has become so prominent in some conflict zones that it made its way to the state symbols of some African nations. Kalashnikov, who died in 2013 at the age of 95, always insisted that he saw the weapons he designed as a means to defend his homeland, not as bringers of death. He was a tank commander during World War II, beginning his career as a weapons designer after a shoulder injury during the Battle of Bryansk. While in hospital in 1942, Kalashnikov overheard wounded soldiers complaining about Soviet rifles and decided to change his career path. 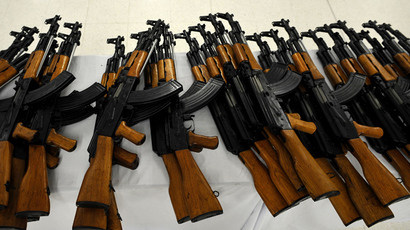 The first Kalashnikov rifle was produced in 1947, bringing its creator the Stalin Prize and the Order of the Red Star. “I believe the difficult life of [Kalashnikov] is an example of dedication to one’s job and homeland. It’s an example for our youths to follow,” said Sergey Chemezov, the head of Rostec, a state-owned umbrella corporation for defense producers. It’s not the first time the AK-47 has appeared on a monument, as Egypt erected a giant statute of the iconic rifle’s barrel and bayonet at the Sinai Peninsula to commemorate soldiers who died in the Battle of Ismailia in 1973.